In close partnership with the FIE as part of its Clubs Movement Initiative (CMI), Fencers Club—the oldest fencing organization in the Western Hemisphere—has made great strides to further the FIE’s mission of broadening the base and elevating the level of fencing worldwide. As the representative club for the Pan-American region, Fencers Club has hosted three CMI sessions since 2014: two month-long coaching advancement sessions and, most recently, a Pan-American athlete training camp in March of 2016 (see video HERE). 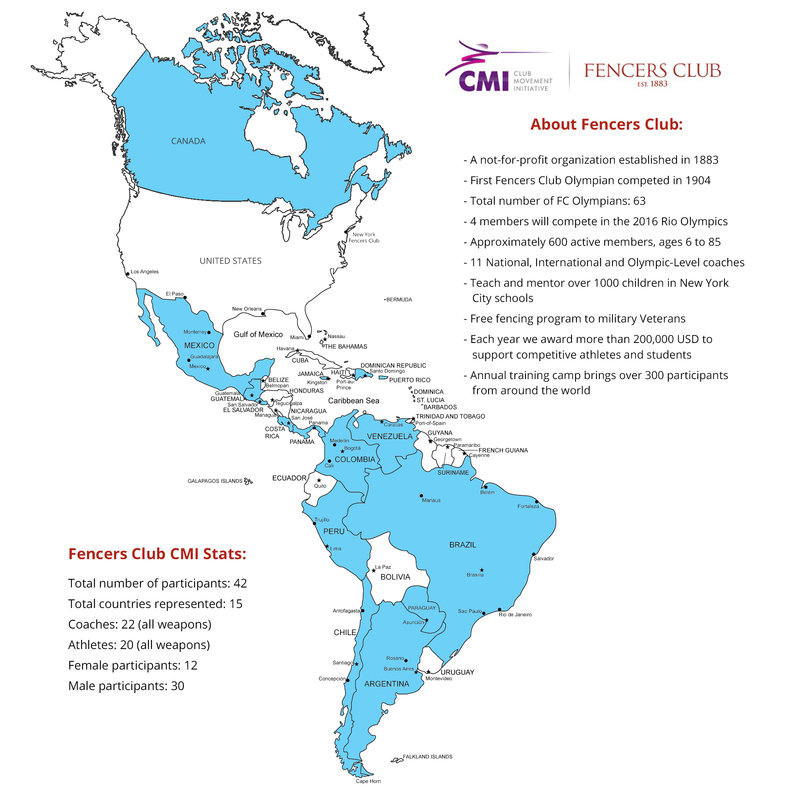 All told, the CMI programs at Fencers Club have trained 40 athletes and coaches from 15 Pan-American countries across all weapons and levels. Participants train for 6-8 hours each day with our world-class coaching staff, including Buckie Leach (U.S. Women’s Foil Olympic Team Coach), Kornel Udvarhelyi (U.S. Women’s Epee Olympic Team Coach), Akhnaten Spencer-El (U.S. Olympian and Coach), as well as engage in yoga sessions developed specifically for fencers by Kamilla Vaksman (née Gafurzianova), Russian Olympic Team Foil Silver Medalist (London, 2012) and intense physical conditioning and agility sessions developed for fencers and led by Verb Fitness. 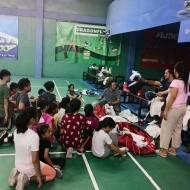 Participants are also encouraged to interact and train with the Fencers Club community of more than 600 members, whose ranks include many collegiate, national and world elite athletes and Olympians. While some of the CMI participants have already qualified for the 2016 Rio Olympic Games or are national team level coaches, others had never set foot in a fencing club. 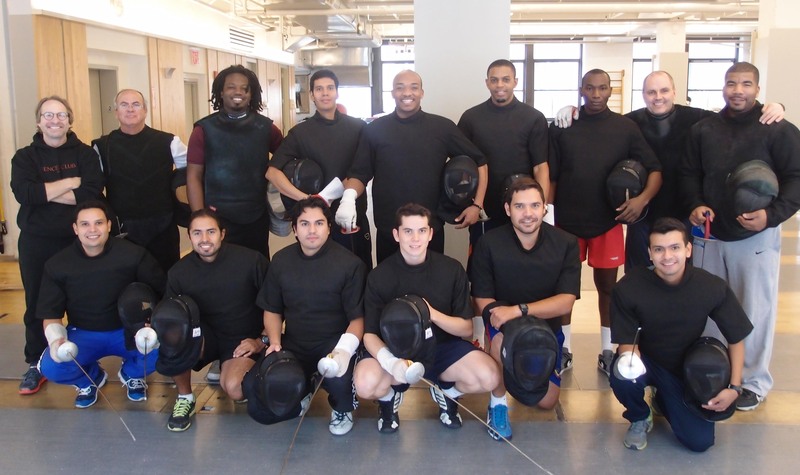 For the second coaching session held in March 2015, Fencers Club welcomed two Jamaicans—a boxer and a cricket player—whose task was to learn as much about fencing and coaching as they could from the FIE CMI coaching advancement program in New York before going back to their home country to kick-start Jamaican fencing. Although neither had ever fenced before, their athletic training and dedication propelled them to learn and advance quickly. Upon their return to Jamaica, they founded two clubs and began recruiting new fencers in earnest. Two of these newly minted Jamaican fencers attended our March and April 2016 FIE CMI Pan-American training camp, along with other Pan-American athletes who have qualified for the Rio Games. After hearing the Jamaican fencers’ stories and goals for the camp, one of these athletes said that she was inspired by their enthusiasm for fencing and drive for learning. Having only fenced for a few months, the Jamaican fencers put in extra hours on top of an already impressive training schedule to develop themselves as both athletes and ambassadors for the sport. For more than 130 years, Fencers Club has been focused on pursuing excellence through fencing and supporting a culture of sharing by serving our local and regional communities through the sport of fencing. In partnership with the FIE, that community now extends across the entire Western Hemisphere and worldwide. Fencers Club furthers our shared goals of elevating the level and broadening the base of fencing through comprehensive and world-class programs that develop top-level coaches, athletes and officials and promote the highest levels of self-sustaining fencing and community programs throughout our region and the world. Fencers Club is most grateful to Mr. Alisher Usmanov, the FIE and the International Charity Fund for the Future of Fencing for the opportunity to share our resources and infrastructure and promote our common goals. To learn more about the CMI program at Fencers Club, please visit the Fencers Club website. While there, make sure to check out videos from all three CMI programs and more here. Visit and “like” us on Facebook to share stories, links and news.